Not to be confused with World 6-8. Area 6-8 is the eighth course of Cosmic Adventure and the fifty-third course overall in Mario vs. Donkey Kong: Mini-Land Mayhem!. The Mini Marios begin at the top center, with the exit door at the top left. In order to reach it, they must simply be guided via a series of Blockers and Magnet Blocks to switch their order so that the Mini Mario with the key leads them. The M-Token is located near the very center, near a Magnet Block on the middle level. 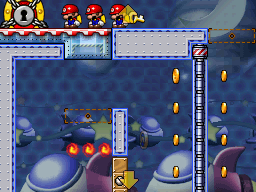 To collect it, the Mini Marios must fall onto the middle Blocker while heading right and follow the Magnet Block to it. The Mini Mario Card is located at the bottom right, at the bottom of a Magnet Rod. At least one of the Mini Marios must traverse it from their starting point to reach it.